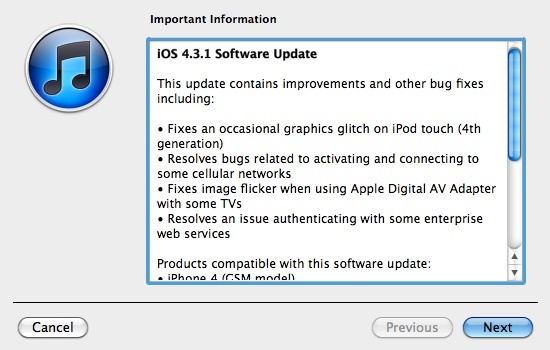 Apple has just released iOS 4.3.1 update for iPhone, iPod Touch and iPad. This update is a minor upgrade to the iOS 4.3 that is already available for download from March 1oth. 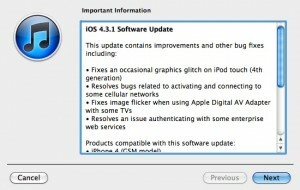 As per the official change log for iOS 4.3.1, the update fixes several bugs reported by users, connectivity issues with certain carriers, on screen graphics glitches with Apple TV and iPod Touch, etc. You can now update your Apple devices online right from the iTunes interface or offline by downloading iOS 4.3.1 IPSW from links given below. Make sure that you have the latest version of iTunes (10.2.1) installed. After downloading the IPSW, open iTunes, connect you iPhone/iPad or iPod Touch and move to the device summary page. Now click on Shift+ restore (option key in Mac) and navigate to the downloaded iOS 4.3.1 file and upgrade the OS offline. Download iOS 4.3.1 for iPod Touch 4G here, 3G here. Download iOS 4.3.1 IPSW for iPhone 4 here, iPhone 3G S here. Download iOS 4.3.1 update of iPad 1 here , iPad 2 (GSM) here , iPad 2 (CDMA) here, iPad 2 (WiFi) here. Now you can jailbreak and unlock iOS 4.3 with Sn0wbreeze 2.3b4 and Ultrasn0w 1.2. We are not sure about the support for new Sn0wbreeze on iOS 4.3.1. So wait for the word from the dev team if you rely on jailbreak/ unlock. mera windows81 tablet normal boot nhi ho rha …. on karo to motherboard aur windows ka LOGO normally display hota hai lekin aage window nhi khulta sirf screen par halki si roshni rahti….. BIOS aur COMMAND PROMPT bhi accsess nhi ho rha hai..
kya dikkat ho sakti hai aur iska hal kaise hoga ? PLEASE HELP ME..